Clear photographs of existing windows. When windows are boarded over, remove boards from typical windows in order to take photographs. Drawings showing the elevation and horizontal and vertical sections of existing historic windows. Include muntins, mullions, transoms, and other window components. For historic steel industrial windows that contain operable units, drawings must include this feature. Drawings showing the elevation and horizontal and vertical sections of proposed replacement windows. In the case of a hung window, provide section drawings of both the upper and lower sash, including meeting rail. For replacement steel windows, include sections of both operable and fixed units. See note below regarding manufacturers’ standard cut sheets. Drawings should be at the same scale and large enough to clearly show construction details. Scale should be provided, measurements noted, and materials indicated for the main components of the window. 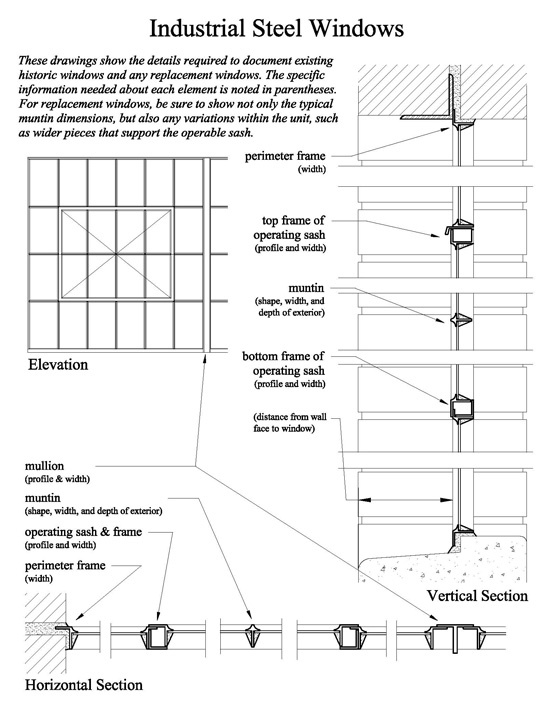 Drawings of the existing historic window should be accurate, based on field measurements. See examples of drawings for wood and industrial steel windows below. Download the drawings for easy reference. Replacement windows must accurately replicate the appearance of existing historic windows. Manufacturers’ standard cut sheets usually are not an adequate substitute for detailed drawings since they are not drawn specifically for the proposed window replacement and do not show custom applications or installation details required for the project. 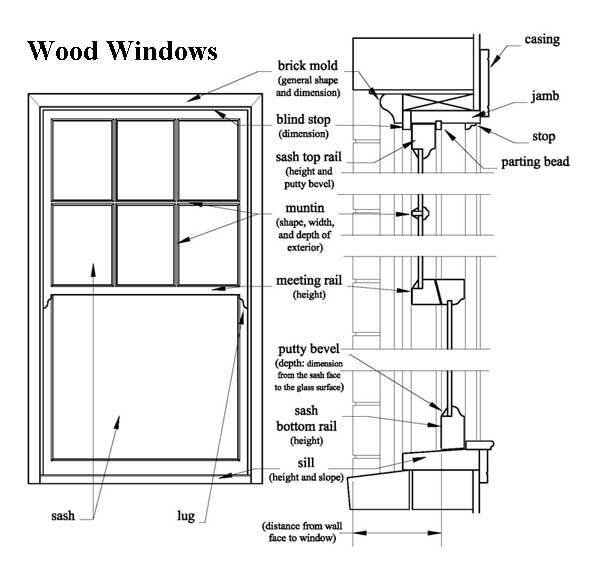 In small projects where windows are being replaced and the historic or existing window is simple in design, manufacturers’ standard cut sheets may be substituted for actual section drawings of the proposed window provided there is sufficient detail for review. Window sections must show the profiles of muntins, meeting rails, sash, frames, moldings, and other features. Construction details must be apparent, including joinery. For all projects, the window’s relationship to the existing wall plane must also be provided for both the existing historic windows, when present, and the proposed replacement window.